Welcome back. We have to talk about crocodiles. I don’t mean crocodile tears. Crocodiles do shed tears, but not because they’re sad or insincere. I mean some of the cooler stuff. 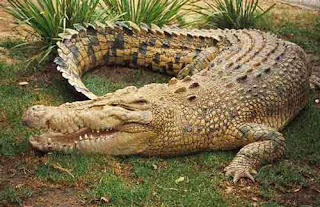 My file is bursting and now there’s another study: Crocodiles sleep with one eye open. 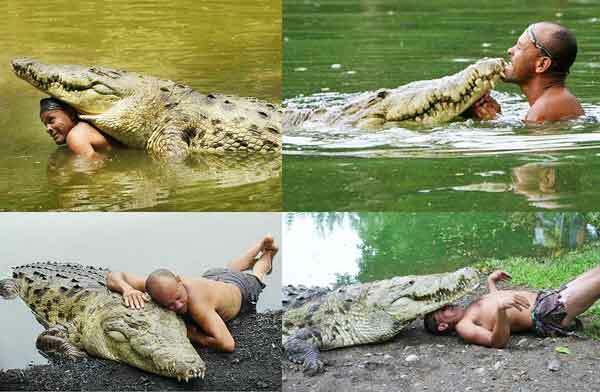 Forgive me if I branch out from crocodile to crocodilian. Crocodiles fall in the taxonomic order Crocodilia along with alligators, caimans, gharial and false gharial. A general term for the whole lot is crocodilians. These large, sturdy, lizard-like reptiles--elongated snout, muscular tail, eyes and nostrils atop their head--are noted for armor-like skin and scales and for having one of the strongest bites in the animal kingdom. Crocodiles occur mainly in the lowland topics; other crocodilians, particularly alligators, extend into the subtropics and temperate zone. Being semi-aquatic, they typically stay submerged for up to 15 minutes, though some can hold their breath much longer, an hour, possibly even two. As a young boy, I occasionally joined others in a one-on-one, hand-slapping, reflex-testing contest, for which we had no name. Searching now, I find Red Hands, which fits the outcome, win or lose. Suffice it to say that the fastest among us would have been no match for the reflexive speed of a crocodilian. The integumentary organ system of a human or crocodilian is the cover--skin and appendages--that separate and protect the body and provide attachment sites for sensory receptors. In recent years, studies, such as one from Vanderbilt University and another from the University of Geneva, Switzerland, have demonstrated that, despite the presence of its armored skin, crocodilians have exquisite sensory abilities. Molecular analyses of the integumentary sensory organs distributed on their scales confirm that each exhibits a combined sensitivity to mechanical, thermal and pH stimuli that has no equivalent in other vertebrate lineages. Two years ago, researchers from the University of Tennessee and St. Augustine Alligator Farm Zoological Park reported that crocodilians used objects for hunting. Not only was it the first reported use of tools by a reptile, it was the first known case of predators taking into account the seasonality of prey behavior. 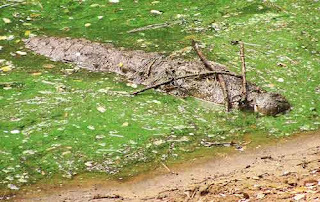 The work began in India when the lead researcher noticed crocodiles pursuing birds by lying motionless for hours in shallow water with sticks or twigs across their snouts. That led to a year of systematic observations of alligators at four sites in Louisiana. There, they found a significant increase in alligators with sticks on their snouts during bird nest-building season. When crocodilians aren’t hunting, attacking and devouring, they’ve been known to engage in play-like behavior. (Really!) The University of Tennessee investigator already cited drew upon published reports, original observations and anecdotal evidence to document play with objects, locomotor play and social play. 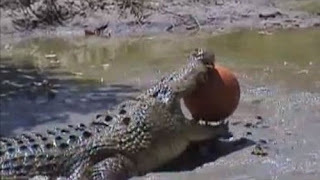 Crocodilians have been observed playing with balls, streams of water, floating debris and even prey. Crocodiles surf ocean waves, caimans ride water currents and young alligators slide repeatedly down slopes. Social play is mainly riding on another’s back, but young crocodilians have been seen playing with other animals (river otter). Though rare, crocodilians have bonded and become playmates with people. As for the latest finding, some birds and aquatic mammals can sleep with only one half of their brain asleep at a time, so-called unihemispheric sleep. The eye neurologically connected to the sleeping brain hemisphere is closed; the eye connected to the awake brain hemisphere remains open and vigilant. To explore this phenomenon with non-avian reptiles, researchers from Australia’s La Trobe University and Germany’s Max Planck Institute for Ornithology filmed young saltwater crocodiles. Although the animals usually slept with both eyes closed, they often opened one eye briefly early in the day. When another crocodile was added to the tank, the sleeping crocodile tracked the intruder with one eye. When a human entered the enclosure, the sleeping crocodiles took special notice, watching with one eye for several minutes. The observations suggest that crocodiles can sleep unihemispherically; however, brain activity measurements would be needed to confirm the interpretation. I hope you got this far with both eyes open, and I hope it was all of interest. There’s more in my file, of course, such as last August’s report that alligators use vocal tract resonance for communication, not just to bellow. Some other time maybe. For now, thanks for stopping by.